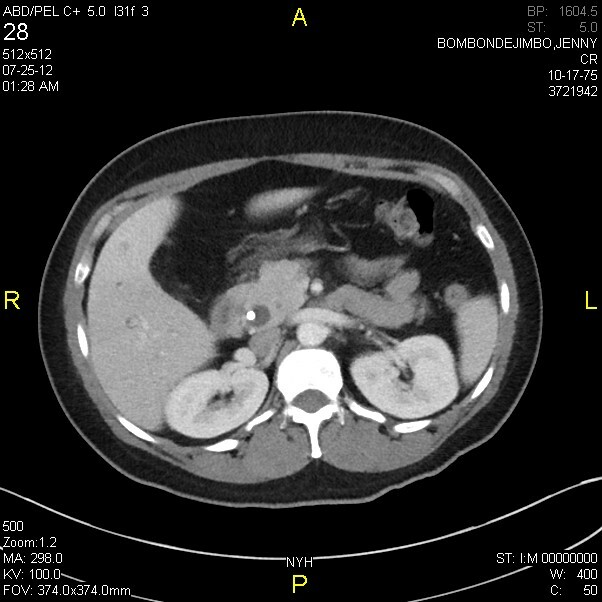 Liver abscess After ERCP and Laparoscopic Cholecystectomy. A Case Report. 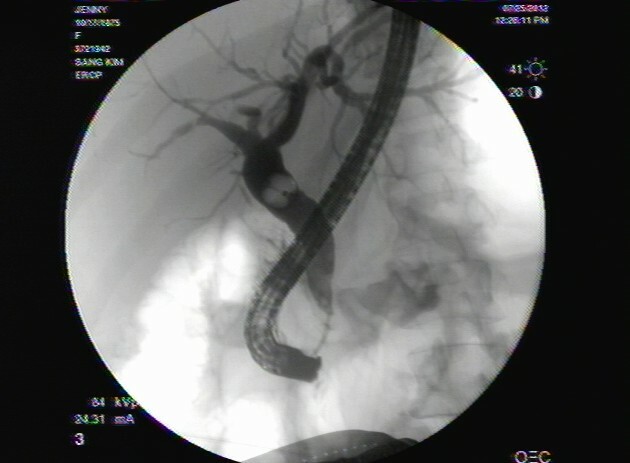 Endoscopic Retrograde Cholangiopancreatography (ERCP) is the preferred technique to clear the common bile duct (CBD) previous to Laparoscopic Cholecystectomy (LC)in a patient with confirmed or high suspected for CBD stones. Infection is one of the most serious complications of ERCP and these include ascending cholangitis, liver abscess, acute cholecystitis, infected pancreatic pseudocyst, peritonitis following duodenal perforation and less commonly, endocarditis/endovasculitis. We present a case of a 32 year-old female with history of cholelithiasis, with a previous biliary colic attack two weeks before her admission. The patient was complained of abdominal pain, nauseas and vomiting for the last two days, without any fever or chills. Initial evaluation showed a patient without acute stress, with normal vital signs and right upper quadrant tenderness with positive Murphy’s sign. Ultrasound (US) shows dilated CBD to 11 mm, cholelithiasis and gallbladder wall thickness. Initial labs showed elevated Liver Function Tests (LFTs) and normal white blood cells (WBC). An ERCP was done, with sphincterotomy, CBD stones extraction and stent placement. Next day patient underwent an uneventful LC and the patient was discharged home next day tolerating diet without any complications. 2 weeks after ERCP the patient was complaining of abdominal pain, nauseas, vomiting, fever and chills. The patient was re admitted and a new US (Fig. 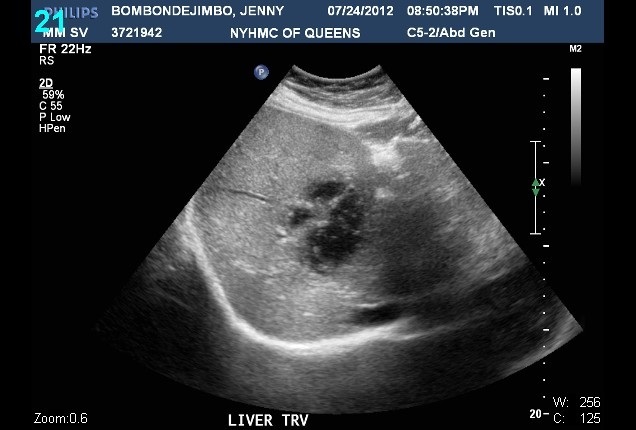 1) showed a 5 x 5x 4 cm complex liver mass compatible with a liver abscess and a dilated CBD to 12 mm. 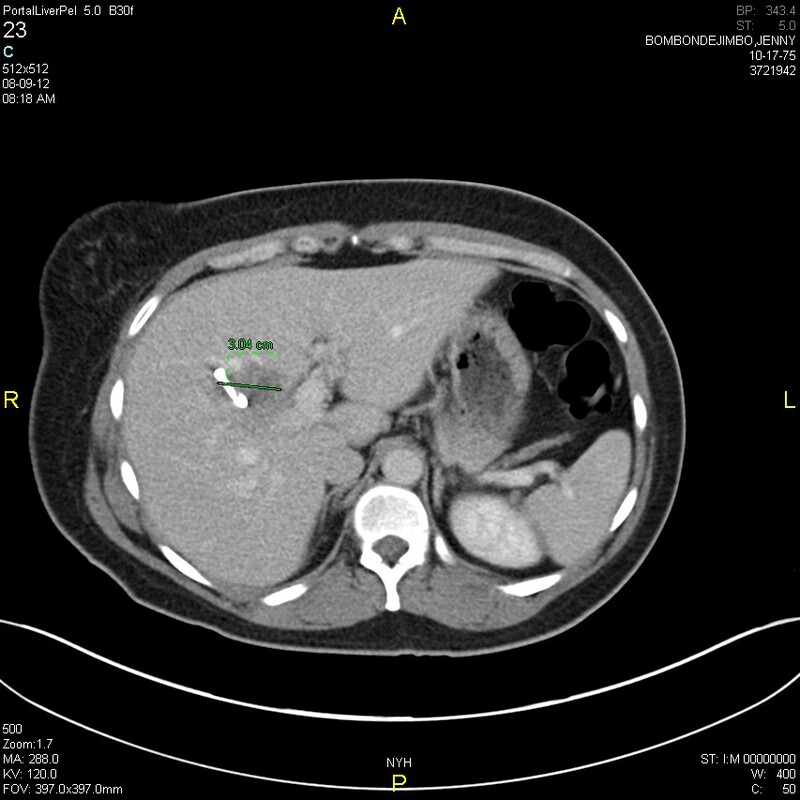 An abdominal/pelvis CT scan was done with confirmation of a liver abscess (6.2 X 6.7 X 5.5 cm) and a dilated CBD (1.6 cm) with mild intrahepatic biliary ductal dilation (Figs. 2,3,4 ). After fluid resuscitation and intravenous (IV) antibiotics (AB) the patient underwent to a new ERCP procedure with stent removal and a CBD stone extraction (Figs. 5,6), then the patient got a liver abscess drainage percutaneously by Interventional Radiology (IR), about 70 cc of pus was removed without complications (Figure 7). 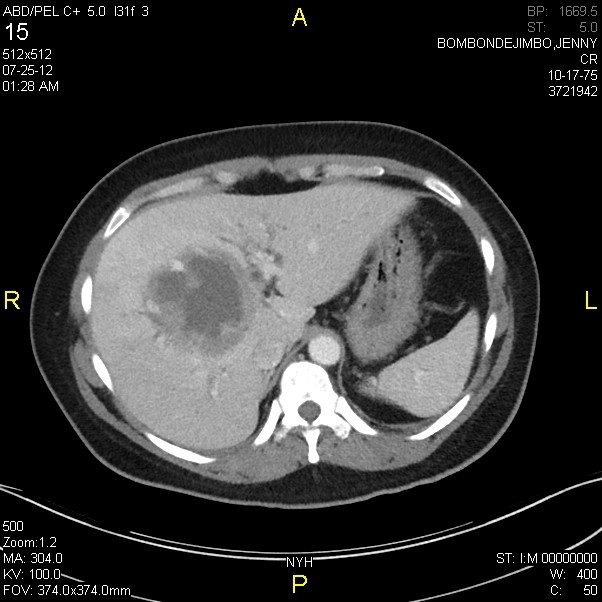 Two weeks after IR drainage the patient got a liver CT scan control that showed interval decrease on size of the liver abscess (Figs. 8,9) and the drainage was removed and patient was discharge home without complications on oral antibiotics. The patient was following up on clinic two weeks after discharge and the patient was doing well with pain resolution and tolerating normal diet. ERCP septic complications are more frequent in patients with CBD stones with cholangitis. 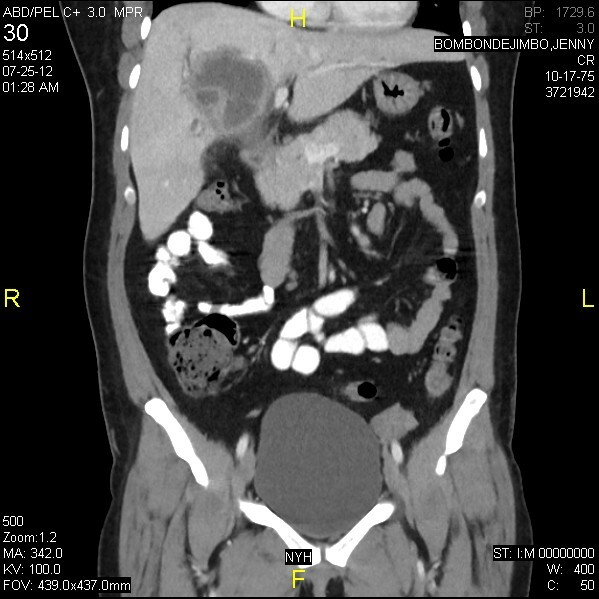 We presented a case report of a patient who got a liver abscess after ERCP and LC that was successful treated with IV AB and percutaneously IR drainage. 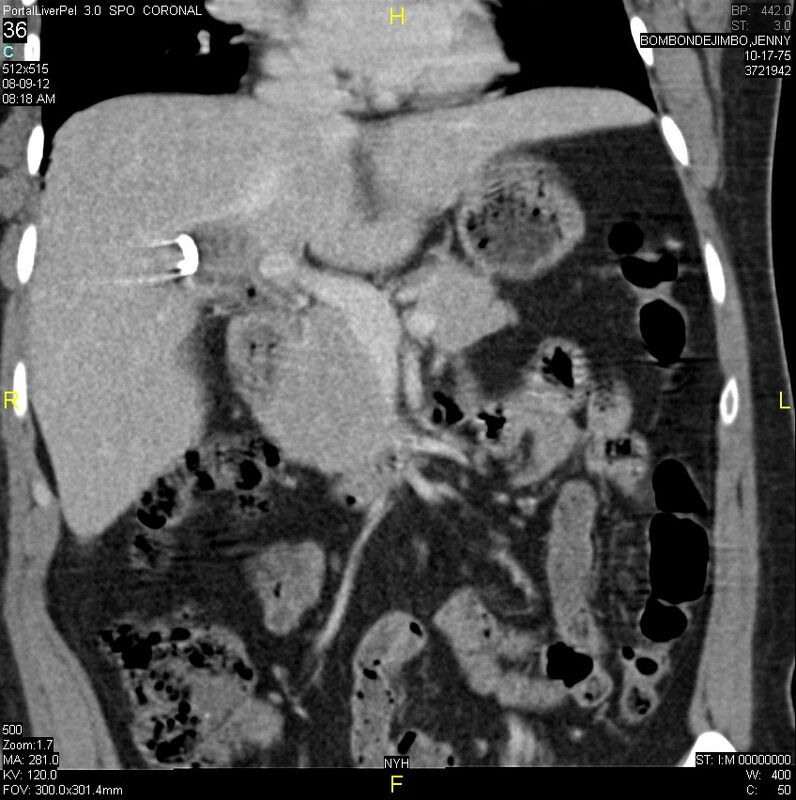 Fig3 CT scan with dilated CBD and stent. Fig5 ERCP view with stent protruding from the ampulla. 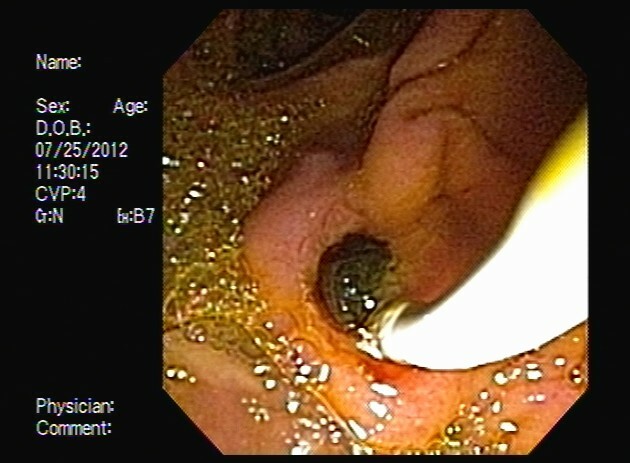 Fig6 ERCP showing dilated CBD. Figure 7. 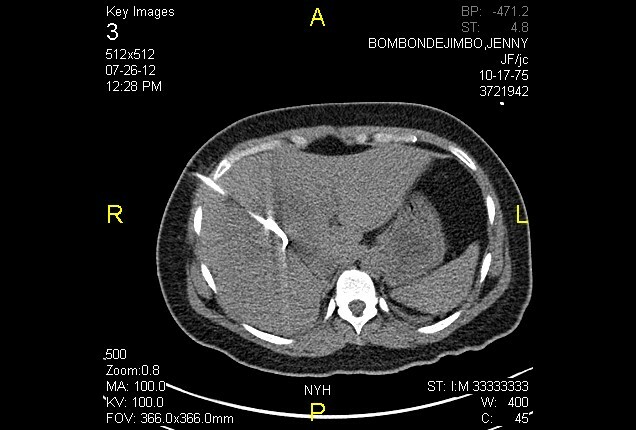 IR percutaneous drainage of liver abscess.